Note: For a more current taste review on a tweaked bag design, open up McLean Clean & Lean – Teriyaki Beef Jerky (Recipe #2). 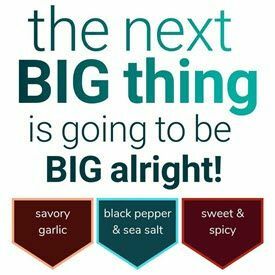 In February 2014 while shopping at the very interesting Goodness Me organic store in Burlington, Ontario, Canada, I stumbled upon a bag of McLean Clean & Lean beef jerky. 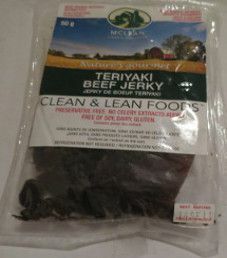 This review will focus on a 1.76 ounce/50 gram bag of the McLean Clean & Lean teriyaki flavor. McLean Clean & Lean jerky is distributed by McLean Meats Inc., where they are based out of West Vancouver, British Columbia, Canada. In 2003, Garth McLean partnered with Michelle Neilson, and together they rebranded a company in 2004 as McLean Meats Inc. Today, Garth’s son Justin and his cousin Mark McLean are part of the driving force behind McLean Meats Inc., making them a truly family-operated company. This jerky is actually manufactured by Made-Rite, located in Langley, British Columbia, Canada, making this a stock recipe. The beef used here is raised ethically, meaning with no growth hormones or additional antibiotics are administered. The cattle also have at least some free range access to graze on grass and roam about. The beef is sourced from carefully selected farms in USA and Canada making this possibly imported meat. This jerky does not use any liquids in their marinade. You could call this a dry rub instead, or what some people refer to as old fashioned jerky. There are some healthy spices and spice extracts used. The sugar level is quite respectable at only 4 grams of sugar per 28 grams of jerky. A sweet based flavor such as teriyaki is allowed up to 5 grams of sugar per 28 grams of jerky. The salt level is also respectable at 260mg of salt per 28 grams of jerky. This jerky does qualify to have no sodium nitrite, or any other similar unhealthy preservatives. Instead, the main preservative is sea salt, which is a great alternative to plain old table salt. It is minimally processed, and contains many minerals and trace minerals. Interestingly, green tea extract is an additional preservative also. Green tea has a very long history in medicine providing many health benefits, and loaded with antioxidants. This jerky also qualifies to have no MSG added. For my liking, this is about the perfect texture, where the jerky is just dry enough to allow easy chewing. 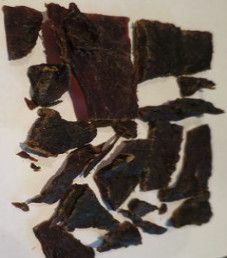 The jerky pieces are of medium thickness, and medium to mostly small in size. Being a teriyaki flavor, it is expected to have a sweet flavor, which it does, without going overboard. There is not much of a salty taste in this jerky. There are no ingredients listed that would suggest a teriyaki flavor, but the combination works for a mild, sweet flavored jerky. I paid $3.99 for this 1.7 ounce/50 gram bag. That works out to $2.34 an ounce, which rates as an average price. Considering the great quality, this jerky would rate as good value for your money. There is a label affixed to both the front and back of this bag. 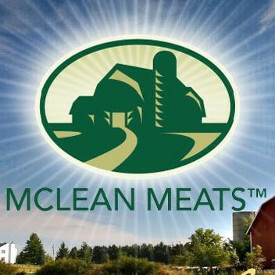 On the front label there is the McLean Clean & Lean logo of a farm, on top of a scenic picture showing a farm and the surrounding land. As for all jerky bags packaged in Canada, there are French translations for everything. There are two trademarked slogans: “Nature’s Gourmet” and “Clean & Lean Foods” (Clean and Lean are in the founder Garth McLean’s last name). Other facts printed on this bar are “Beef Raised Without Antibiotics”, “Beef Raised Without Growth Hormones”, “Preservative Free, No Celery Extracts Added”, “Free of Soy, Dairy, Gluten” and “Contains green tea extract”. The majority of bag categories are covered with a few minor exceptions. Also minor is that the jerky weight is not listed in ounces. 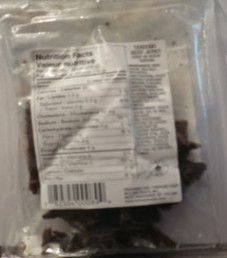 The bag is not resealable but that is common for jerky bags that contain 50 grams and under. There is no description about McLean Meats Inc. but in fairness there is no free space.